Artist’s rendition of MV Olympic Boa subsea support and construction vessel. Image courtesy of Kleven Maritime AS. The MV Olympic Boa subsea support and construction vessel has been chartered to Boa Marine Services for three years initially. Image courtesy of Boa Offshore AS. 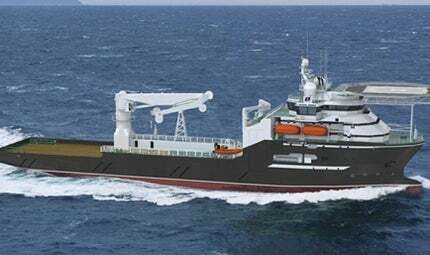 The Olympic Boa subsea support and construction vessel was built by Kleven Verft shipyard. Image courtesy of Marin Teknikk AS. Olympic Boa is a subsea support and construction vessel owned by Olympic Shipping. Kleven Verft received a contract in June 2012 to build the vessel at an estimated cost of NOK600m (approximately $100.3m). The vessel was christened during a naming ceremony held in March 2014 and was handed over to the owner in April 2014. Olympic Boa was chartered to Boa Marine Services under a three-year agreement, with further options. The charter period began in the second quarter of 2014. Olympic Boa is a Marin Teknikk MT 6022 MK II design with an overall length of 115.4m and moulded breadth of 22m. Its length between perpendiculars is 108.25m, while depth to main deck and maximum draft are 9m and 7.12m respectively. The vessel has deadweight of approximately 7,150t at maximum draught. Maximum cargo capacity on the main deck is approximately 3,450t. The gross tonnage capacity of the vessel is 7,883t and the net tonnage capacity is 2,365t. The main deck of the vessel covers an area of approximately 1,300m², and has a width of 21m and maximum loading capacity of 10t/m². The vessel has one moon pool measuring 7.2m long and 7.2m wide. The vessel has a capacity to hold 1,750m³ of fuel, 1,250m³ of potable water, 4,400m³ of ballast water, 175m³ of methanol and 50m³ of lubricating oil. It is also equipped with anti-heeling tanks with a capacity of 1,000m³ and miscellaneous tanks with a capacity of 60m³. Olympic Boa is equipped with a fully active heave compensated (AHC) offshore crane with a wire length of 3,000m, and deck lift of 250t at an outreach of 650m and 135t to a water depth of 3,000m. It is also provided with one hangar, placed on the main deck, covering an area of 211m². Polar Onyx is an offshore construction vessel (OCV) built at the Ulstein Verft shipyards in Norway. A 250t offshore pedestal crane with an AHC main winch with a capacity to carry 2,500t at 5.5m outreach is also provided on the main deck. The two auxiliary winches by Caterpillar provide access to depths up to 2,500m with a lifting capacity of 20t at 36m outreach, while the other auxiliary winch has a wire length of 50m and a capacity of 5t at maximum outreach of 20m. It is also equipped with two folding cranes, which have a winch capacity of 0.9t at an outreach of 12m, and two off cranes at the captain deck with a capacity of 5t and maximum outreach of 16m. The ship is equipped with a removable cargo rail of approximately 14m PS (pole system). The vessel also contains two electricity driven double windlass / mooring winches and two aft mooring winches with a pulling capacity of 12t each. Olympic Boa has one anti-heeling system with two transfer pumps, each with 1,500m³/h capacity. The vessel features one work-class remotely operated vehicles (WROVs) hangar, installed with launch and recovery systems (LARS) incorporated into the two large WROVs deployed on the port and starboard sides. It is also fitted with two permanent WROV systems, providing access to depths up to 4,000m. An aluminium helicopter deck with a capacity to handle maximum take-off weight of 15t is available for a Sikorsky S-92 helicopter. It complies with the Norwegian continental shelf, IMO and UK 437 regulations. Kongsberg supplied its Kongsberg K-Master dynamic positioning (DP) system, independent joystick system, Dynpos AUTR and Kongsberg Integrated Automation System (IAS). The position reference systems include two heading reference systems, two differential global navigation satellite systems (GNSS), two acoustic USBL systems/HiPAPs, a CyScan position reference sensor and a RADius relative position reference system. Other onboard navigation equipment includes radar equipment, satellite navigator, chart system and conning and compass systems. The vessel is also fitted with an echo sounder, autopilot, speed log, satellite log automatic identification system (AIS), voyage data recorder (VDR), radio equipment, TV parabol, helicopter beacon and monitoring system. Two enclosed lifeboats on both sides of the ship accommodate up to 50 people each. The vessel also features one life raft capable of carrying 30 people each side, one lifeboat PS and one man overboard (MOB) fast rescue craft. Also provided onboard are 110 survival suits, emergency evacuation breathing device (EEBD) masks and life jackets. The OCV has five deck areas; the tween deck, the main deck, the shelter deck, the boat deck and the captain deck. The tween deck houses the switchboard room, while the main deck has the engine control room and the project offices. The party chief office, the ROV senior supervisor, conference room, ROV online room and SB ROV control are all located on the shelter deck. The boat deck houses the ROV offline room, the shift supervisor and the project engineer office, while the main office is on the captain deck. "The propulsion system allows the vessel to cruise at a maximum speed of 15.8k." Olympic Boa offers accommodation for 110 personnel. It has 32 one-man cabins and 39 two-man cabins. Other facilities include a hospital, a reception and a mess with 50 seats. The ship also has a gymnasium, conference rooms, lounge, SkyLobby and a heli-reception. It also has a coffee shop on the main deck. Other facilities include single day rooms for 24 people and double day rooms for 23 people. Separate wardrobes with locker facilities for male and female passengers are also onboard. Olympic Boa is powered by a diesel electric propulsion plant equipped with five 2,230ekW main engines and a 1,700ekW harbour genset generating a total power output of 12,850ekW. The propulsion system includes two frequency-controlled Rolls Royce Contaz CRP25 propellers with a rated capacity of 3,000kW each, and two fixed pitch tunnel thrusters with a power of 1,500kW each. The vessel is further outfitted with two tunnel thrusters of controllable pitch with a power of 1,400kW each and one 1,200kW retractable fixed pitch thruster. A Rolls Royce tunnel thruster with a power generation capacity of 800kW is fitted at the aft. An emergency generator of 300ekW and exhaust gas cleaning system are also fitted onboard the vessel. The propulsion system allows the vessel to cruise at a maximum speed of 15.8k.